There are many elements that go into the making of any work of fiction. Generally, a combination of personal experience, imagination, and research. Each author has their own unique well of experiences to draw on, and their own perspective on how they viewed their experiences, which is why regardless of the idea, each writer can bring a unique perspective to any novel. 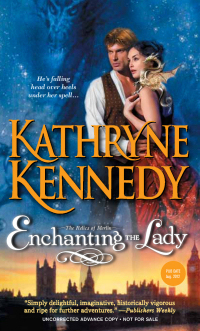 Today I’d like to share with you some of the elements that went into the creation of the RELICS OF MERLIN series, which includes: ENCHANTING THE LADY, DOUBLE ENCHANTMENT, ENCHANTING THE BEAST and the upcoming brand new story (December 2013), EVERLASTING ENCHANTMENT. In the RELICS OF MERLIN, the world came first. Although the books are stand-alones, they are all connected by Merlin’s thirteen relics—jewels that the sorcerer Merlin crafted, each holding a different spell of power. 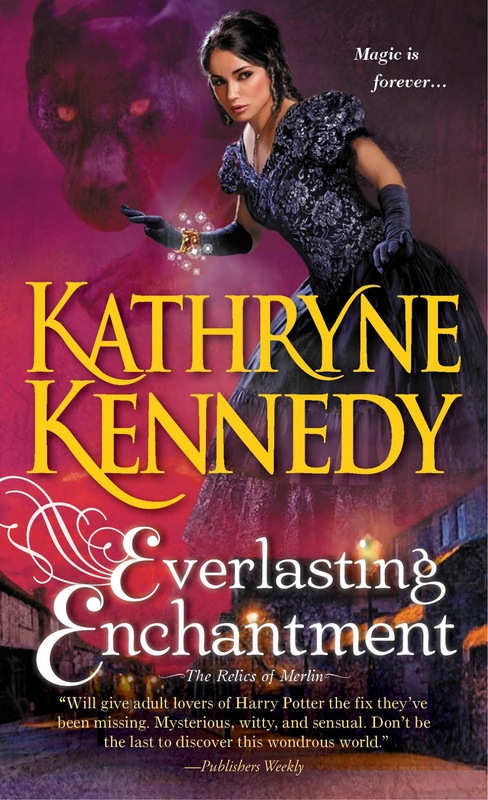 In my alternate Victorian reality, titles are held by the inheritance of magical powers, with the higher title possessing the more powerful magic. The only power greater than a royals’ is one of Merlin’s thirteen relics, and their location is as mysterious as the spell each relic contains. 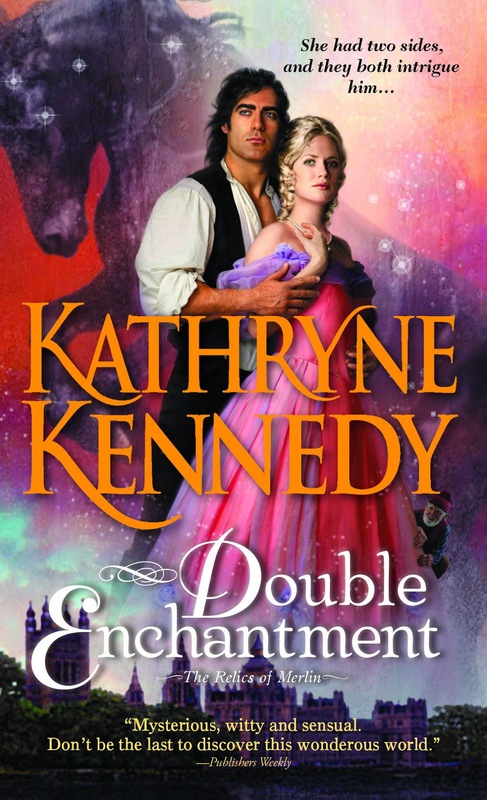 From that premise different story lines and different characters sprouted, with each book dealing with a different relic and two new characters’ love stories. I went cave-crawling (literally, with knee pads) in a Kentucky cave. This wasn’t a tourist cave, but one my brother-in-law had discovered. Once inside it widened considerably, but to get inside we had to crawl through some very tight squeezes. The absence of light and the maze-like passages were terrifying, and the first time I went in I raced back out within five minutes. But I don’t like to let fear control me, so I plunged back in. I wish I could say it was fun, but the hand-light went out at one point, the cave crickets on the ceiling looked like giant gray spiders, and a river ran through the larger passages and that water was cold. But it did give me an understanding of the London Underground I envisioned for my book, and an experience I’ll never forget. I’ve read and own many books on the Victorian era, from architecture to furniture to social economics. (I listed many of my research books on my website blog). I have always loved that time period, so I found the research fascinating. Then I created maps of my alternate Victorian London to keep track of changes to name places (Pall Mall became Pall Mage, Belgrave Square became Gargoyle Square, and I added the Hall of Mages next to Buckingham Palace, for example) because with the influence of magic, the city would develop differently. I also have a ‘map’ of a Victorian mansion, with the type of furniture for each room listed (In England, the first floor of a home is the ground floor, and the first floor is called the second, which is often confusing to my American mind :}). I also have a chart with hereditary titles, how each peer is addressed, and their level of magic. I keep a dictionary of my own words, because I often make them up; and a chart of the relics, when they were discovered, what type of jewel and spell (if known). I also create character sheets along with animal references, since my heroes’ natures are so strongly influenced by their were-creatures. By writing everything on loose paper, and then use binder clips to keep them organized. I print pictures of Victorian costume, architecture, etc. and keep them with that packet, so that I have visuals as well as notes to refer to. When it comes to historical research, if I need it for the storyline it goes in. I have research that never goes into the story because it isn’t necessary, but it still gives me a general feel of the world, so it’s not wasted. When it comes to the magical elements that I weave into the world, I’ll go into a bit more detail, because I try to instill that sense of realism into the story. And another element I have to weave into the plot. I try to add in the rules of my magic early on, so the reader knows what to expect. But again, I try not to dump it in all at once, but use it to enrich the plot. “Look at Lord Gremville’s new coach and four.” Uncle Oliver’s voice dripped with disdain. Felicity stared out the window. Marquesses’ powers were limited to illusions and the transfer of objects, so she knew that the white unicorns with golden horns weren’t real, that the gilded coach camouflaged a plain black finish. Still, the sight took her breath away, and she longed to stroke the foreheads of the animals. I salute you for being able to overcome your fears and explore that cave...I don't think I could quite suppress my mild claustrophobia enough to participate in that type of experience. The new covers are beautiful, congrats. 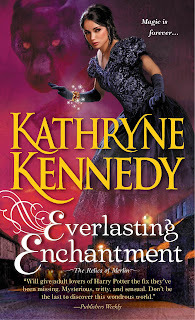 Really looking forward to Everlasting Enchantment!!! I agree with Elf! Not sure I could do that, and I'm not what you'd call claustrophobic!